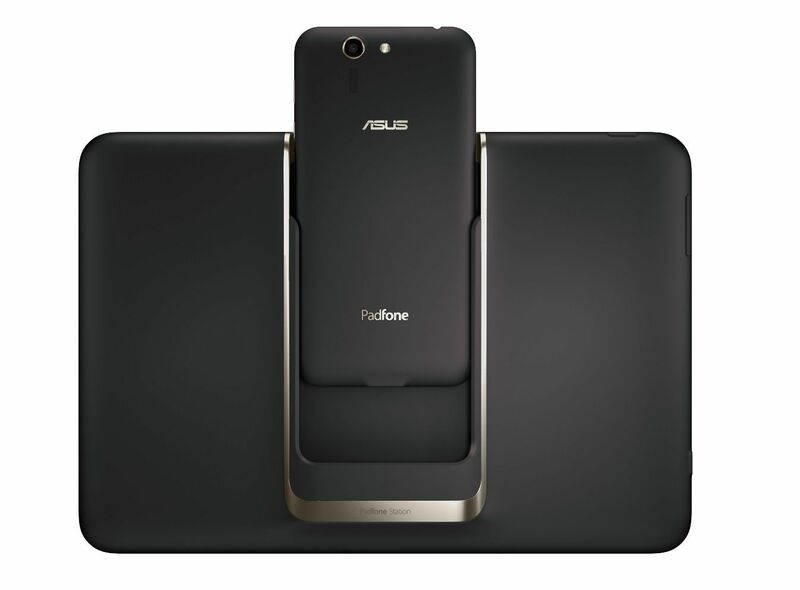 The ASUS Padfone S is the latest phone / tablet combo series that is unique to ASUS. The Padfone S offers smartphone and tablet experience in one single device that allows you to choose the ideal platform for your different scenarios. Once the phone is connected to the tablet dock, the full 9” HD glory comes to life. Detach the Padfone from the docking tablet for extra mobility and when needed, plug it back for a tablet experience. ASUS has gotten down the phone / tablet combo experience pretty well, with no fuss or fiddling with wires required. The quick and dirty lowdown is as follows: at the current promotional price of $399, the Padfone S offers great specs at a relatively low cost. If you think of it as a phone first, then an additional $199 to transform your phone into a tablet is indeed tempting. But it is more of a makeshift tablet than a great one. I quite like the design of the phone. It is simple and elegant but some may find it boring. 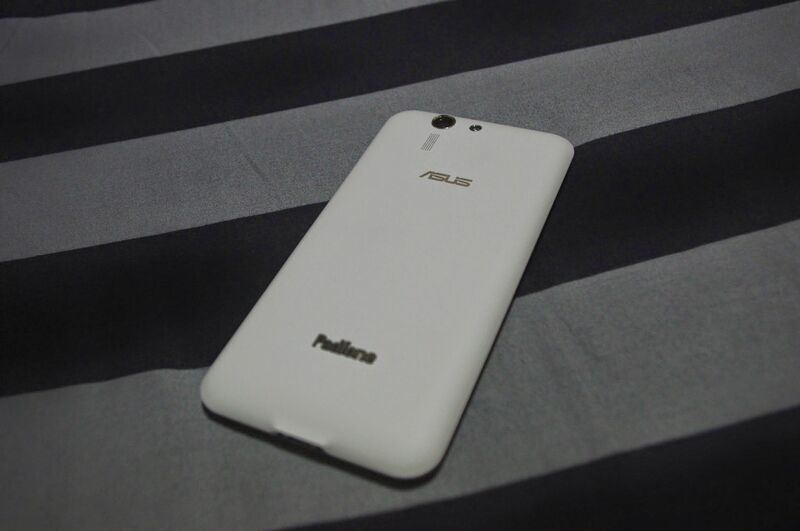 The front of the phone is covered in glass, with the 5.0” screen and a silver ASUS logo on the bottom. The sides are slightly tapered and covered with brush aluminium which gives it some added style. However, from the side of the phone you would notice that it is actually quite thick compared to similar phones. The removable back casing of the phone is in matte plastic, which is comfortable to hold. Located on it is the 13-megapixel camera, flash and a single back facing speaker. It takes some effort to remove the back casing to access the microSIM and microSD slots underneath. There’s no clear opening but start from the USB port and slowly work your way around to pry open the casing. Although it comes with only 16gb of storage, it offers expansion through a microSD slot, which I feel is extra important in this hybrid device. The Padfone S supports wireless Qi charging too. The Padfone S has specifications that rival recent flagships with the speedy Snapdragon 801 / Adreno 330 chipset and 2gb of ram. 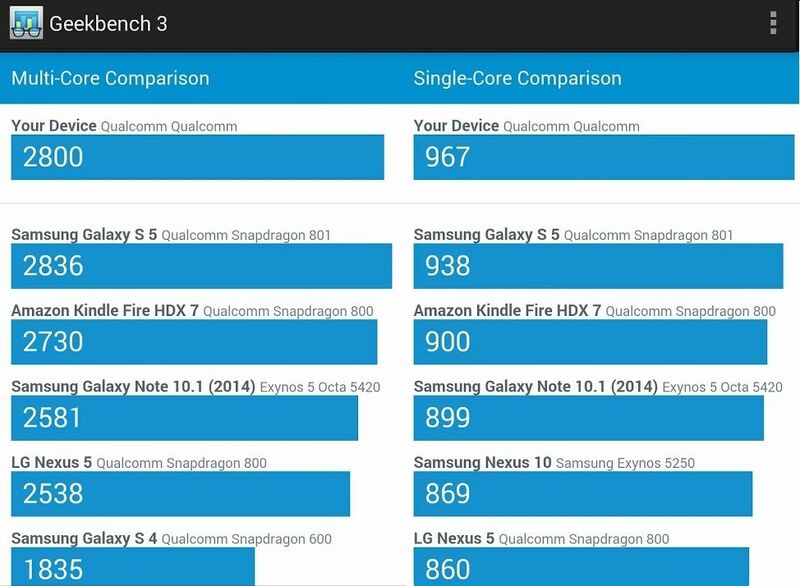 Only the Snapdragon 805 like the Note 4 and Nexus 6 is faster, but the Padfone S itself is plenty fast. The phone doesn’t compromise on specifications and offers it at a low price point of $399 (ongoing promotion) or $449 for the usual RRP. See the benchmark scores for more information on the overall performance. The Padfone S is also shockproof and water resistant. It can survive drops on a steel surface from a height of up to 1.5m. That’s a nice feature to have, and it does this without looking like a tank. No worries on accidental drops and cracked screens. ASUS also adds in a 1-year Screen Replacement Warranty service valid for single use, if you do break the screen, with the caveat that the phone was NOT damaged from over 150cm drop, or ruptured under a deliberate act of external forces. The water resistant is a little weird, it is certified water resistant against water equivalent to 3mm of rainfall, and when tilted up to 15 degrees for 10 minutes. It will survive the occasional caught in a downpour situation but do not try to bring it to the shower or wash it under a tap. With the tablet dock, slide the handset down firmly until the phone locks in place. A vibration feedback indicates that the phone is fully docked and the tablet screen will come on. The whole mechanism is nicely engineered, and felt secure. Even while carrying the tablet around in the my hand, upside down, there was no fear of it dropping out. The tablet offers a 9” 1920 x 1200 pixel resolution, 4990mAH battery and, dual stereo front facing speakers. The back of the tablet dock is in a similar rubbery material as the phone and offers good grip. It comes in two colours to match the phone too if you were wondering. I just happened to get a mismatch review set. All the processing is done within the phone. The tablet design could have been better. For just a screen, it is huge. The ASUS logo is embellished in the top right corner. There is a large amount of bezel space that makes the screen feel smaller than it is. The physical dimensions are 250.4mm x 172.25mm x 11.63mm and when placed next to an iPad Air, the Padfone tablet dock is actually 10mm (1 cm) longer than the iPad Air which offers a 9.7” display size. The tablet dock is also significantly thicker. 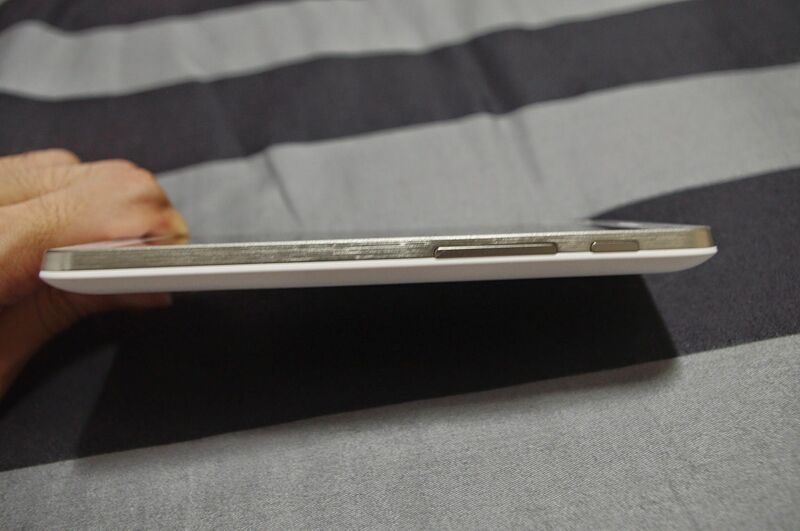 Due to the docking mechanism, the thickest point of the dock is in the middle. The combined weight is 663g. That’s still alright when holding the tablet in your hands as you would be gripping on to the slimmer sides but it feels a little unstable when left flat on a table. Compared to fullfledged tablets, the trade off here is you get a bigger and heavier tablet. 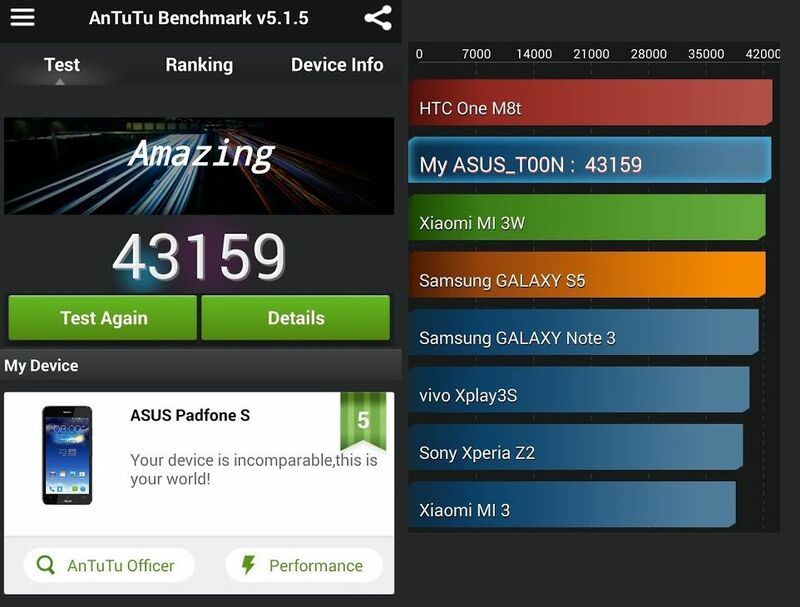 The Padfone S runs on Android 4.4.2 and uses ASUS own ZenUI interface. 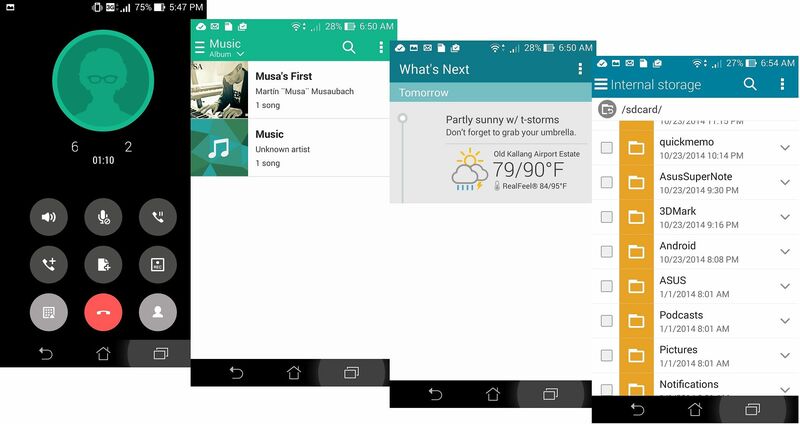 The ZenUI interface is modern looking, with flat styling, and colour bars typical of new Kit Kat and Lollipop styling. Performance wise was also smooth and doesn’t feel bloated. A combo device also means data connection is shared. All my previous iPads and tablets have been pure WiFi only device and while usable, a data connection does offer more flexibility. Tether is a workaround but it is troublesome. Additional convenience is that all applications and data are kept on one device. So even applications like Whatsapp work in tablet mode too. Your books, emails, movies, etc are all in one single device, which also means that the 16gb inbuilt storage is definitely not enough. The big problem would be games as Google has locked down app access to the external storage. On the software front, the two platforms are actually slightly different, as most programs that run on either the phone or tablet do not automatically transfer to the other platform. You would need to restart the program. 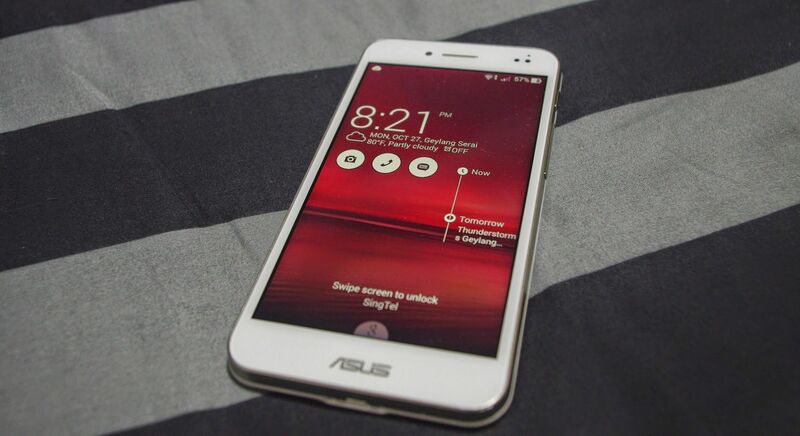 Certain apps such as ASUS own are able to handle the transition thanks to the Dynamic Display setting but most do not and it is safer to just quit the program before docking or removing the phone. One plus point is the default launcher is able to support two different interfaces, widget / app combos in either phone or tablet mode. It is a good feature actually. It allows the user to personalise the phone and tablet differently. I can use different wallpapers, put my media, video apps, games on the tablet homescreen, while retaining apps such as whatsapp, calendar on my phone homescreen instead. As a phone, the Padfone S generally blazed through all tasks, and handled gaming like a champ. When connected to the tablet dock, there was a distinct slight slowdown, and additionally manifested in certain apps. It seems to be a touch input lag. Chrome was one of them. Trying to scroll in Chrome was a painful experience for certain websites, require long swipes to scroll and the response felt noticeably sluggish and unresponsive. I switched to the default browser when using the tablet mode and it was a marked improvement. This was a similar experience shared by the reviewers from PCMag. However, it is not a hardware problem. In fact, the ASUS Supernote App was a joy to use, super responsive in scribbling quick notes, or making random doodles. In a post just earlier today, ASUS also committed to deliver the Android 5.0 Lollipop update to both their Padfone and Zenfone series. The Zenfone devices will be the first to receive the new update. Padfone S and the Zenfones will get the Android 5.0 Lollipop update in April 2015. April 2015 might sound a long time away, but at least there’s a commitment from ASUS to deliver by then. Is 2300mAH Battery Going to be Enough? ASUS has included a non-removable 2300mAH battery. Yes, many question marks have been raised on the smaller battery capacity. While these concerns are understandable, actual usage over the past few days has seen it adequately lasting a whole day. Besides, the tablet dock also has the ability to charge the phone and if you use them together, both devices can last for about two days. I used the phone through a typical day work and after 7 hours, the phone was down by around 25%. That included usual usage, including around 10 min call time, two email accounts running in the background, occasional surfing and IM programs running. The Padfone S is meant to be used with the tablet dock. And with it, the added 4990mAH battery really helps to extend the life of the device and you are assured that it can sustain whatever tasks you throw at it. The 13-megapixel rear-facing camera is rather capable. The photos I took were generally decent, offering accurate colours and contrast. Good detail captured. The PixelMaster technology also can increase light sensitivity by up to 400% for night photos but does introduce a fair bit of noise. Good enough for instagram or facebook photos. 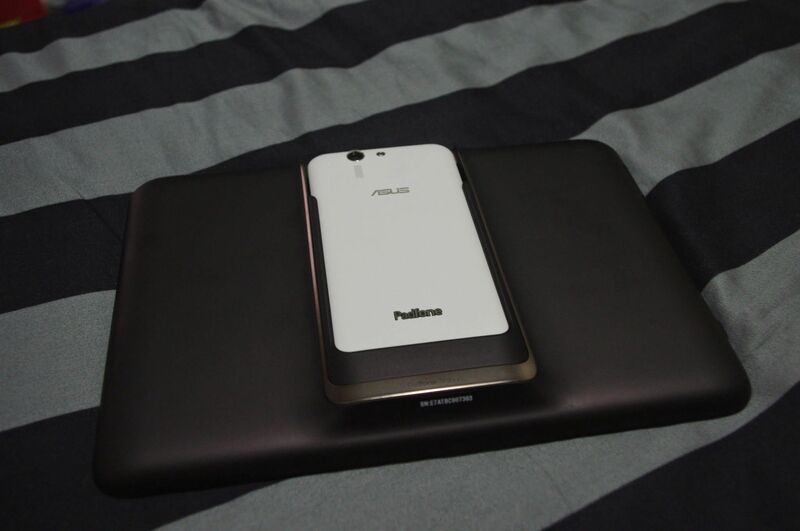 The PadFone S is now available on ASUS online and other retail outlets. You can check out the physical set at the ASUS shop at Funan, Unit #03-07. There’s an ongoing promotion: purchase the PadFone S from 18-Oct to 2-Nov at $399 (SRP$449), and receive Free 1-year Screen Replacement Warranty. 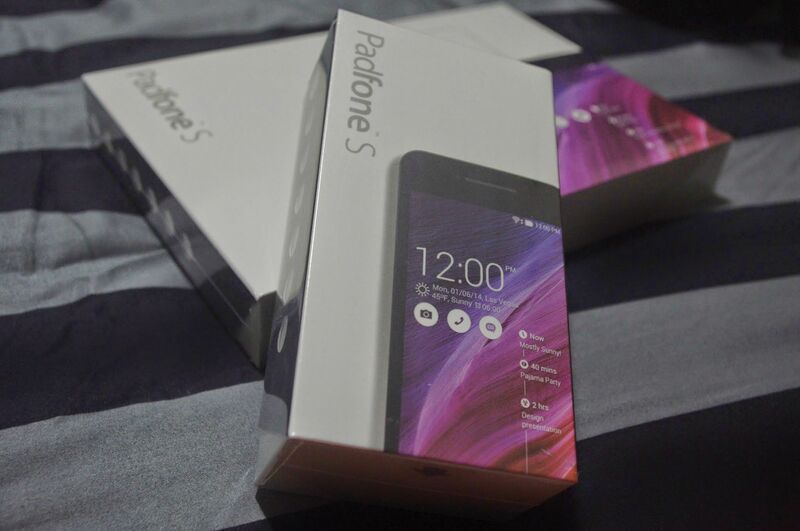 For a chance to win the PadFone S, head over to ASUS Singapore Facebook page to take part. Like, Post, Tag, & Share to win a PadFone S! The Asus Padfone S tablet dock will retail for S$199. It is available for purchase at the ASUS Retail Outlets, such as the one at Sim Lim Square. A phone able to switch to a tablet and vice versa is an interesting proposition. But the reality is, it comes with a compromise, which is the tablet dock design and the software lag that plagues certain apps in tablet mode. Software could be improved and hopefully soon. On the design, perhaps we have been spoilt by super slim tablets and bezels that blend into the screen. Personally, having used the Padfone S in tablet form the last few days has been a genuinely pleasant experience. I enjoyed the ability to quickly transition from phone to tablet, perhaps to share something with my friends and family, or to read an ebook / magazine. I think the current pricing is attractive too. For S$399, you get a phone spec that almost rivals competitor flagships such as the S5 and LG G3, at less than half the price, even today. If you already own a tablet, then the Padfone S may not make much sense for you, but otherwise the combo price is an attractive consideration for a relatively high-spec phone and a decent large-screen tablet.